Nowadays the name Tuileries evokes the formal gardens that follow the Seine River from the Louvre to the Place de la Concorde. A spot beloved of Parisians and tourists alike, offering one of the most beautiful vistas in Paris, and in my opinion in the world. But there used to be something more there: a royal residence, built over several centuries by French monarchs. The name Tuileries simply means “tile factories,” the activity that took place there in the middle ages. In the 16th century Queen Catherine de Medicis, widowed and Regent of France, purchased the land with the idea of building a palace there. 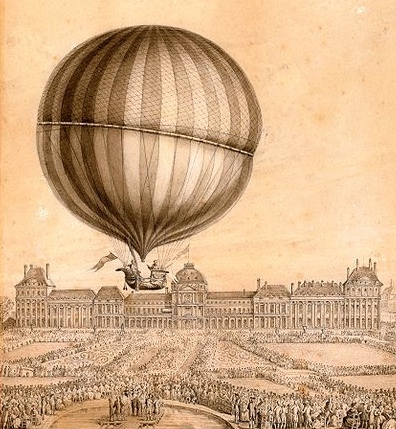 The construction was well under way when her astrologer, the famous Nostradamus, predicted that she would die “near Saint-Germain.” And it just happened that the new palace was located in the vicinity of the Church of Saint-Germain-l’Auxerrois! So after Queen Catherine fell out of love with the spot the construction simply sat abandoned for decades. It was not until the reign of King Henri IV, great builder and one of the most remarkable monarchs France has known, that the building was completed and linked to the Louvre on the side of the river. But the construction of the symmetrical aisle, along what is now the Rue de Rivoli, was interrupted by the assassination of the King in 1610. Again the palace was abandoned for 50 years, until Louis XIV, Henri IV’s grandson, decided to complete the construction and settle there, at least part of the year, for the Court was still quite nomadic. Was the Tuileries at long last ready to assume the role of royal residence? No. The Sun King only occupied the Tuileries for a few years. The new glittering Palace of Versailles beckoned, ten miles away from Paris. Colbert, Louis XIV’s most trusted minister, objected that it was unwise to sever in such an obvious manner the functional and emotional link between the monarch and his capital. With the benefit of hindsight we now realize how prescient and politically astute Colbert was. His remark seem to foreshadow the troubles of the Revolution. But after Louis XIV and his Court left the Tuileries did not sit empty. It was divided into apartments occupied by various courtiers or artists the King wanted to honor with a free residence in Paris. Then Louis XIV died and his five-year old great-grandson became King under the name of Louis XV. Philippe d’Orléans, who had become Regent during his cousin’s minority, brought the government and Court back to Paris. The old Palace came back to life once again, and once again it was soon deserted by the royal family. The young Louis XV did not like it. Soon he returned to Versailles and took the Court with him. For the next 50 years the Tuileries was once more occupied by occasional tenants, and served as a venue for concerts, plays and operas. Louis XV died in 1774, and the new Queen, Marie-Antoinette, became quite fond of Paris, its balls, shows and amusements. She claimed one of the Tuileries’ apartments for herself and had it refurbished to she could sleep there whenever she stayed late in the capital and did not feel like returning to Versailles in the middle of the night. Alas the love story between the Queen and her capital did not last. Pamphlets claimed that she used her Tuileries apartment for trysts with her alleged lovers. Soon Marie-Antoinette could no longer appear in Paris without being booed. She resided in Versailles, at Trianon, in Fontainebleau, in Marly, in her own Chateau of Saint-Cloud, in all of the royal residences around Paris, but she no longer set foot in the capital or the Tuileries.